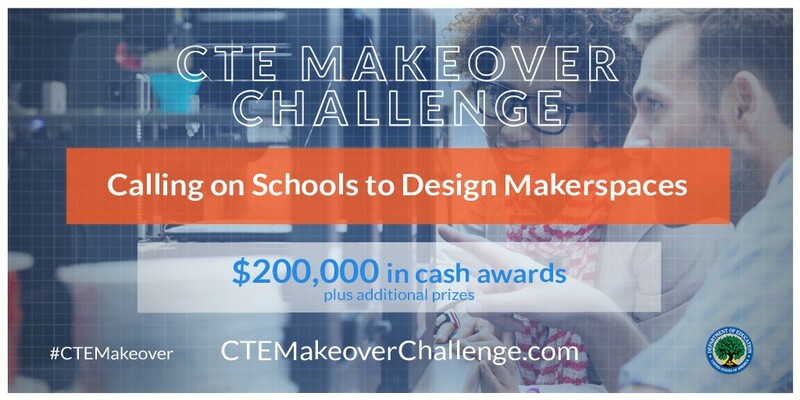 The Handibot team at ShopBot Tools is proud to be helping with the CTE (Career & Technical Education) Makeover Challenge, an initiative of the U.S. Department of Education. Schools from all across the U.S. recently entered their designs for a school-based makerspace, and the winning schools will win resources to make those makerspaces for real! What we’re doing to help. ShopBot Tools is getting involved in a big way. We’re helping the winning schools by donating Handibot® Smart Power Tools to some of the makerspaces. We’re donating our time by offering training classes, webinars and blogs to help teachers and students set up and get the most from their digital fabrication tools; and we’re even providing credit toward purchase of a ShopBot CNC tool. Sallye Coyle, ShopBot’s Director of Community Outreach, explained the company’s decision to support the CTE Makeover Challenge. ShopBot Tools and Handibot Smart Power Tools are used in countless schools, makerspaces, FabLabs, and other community-based learning environments in the U.S. and around the world. We’re thrilled that this Makeover Challenge is underway. It’s yet another initiative that will help the next generation be prepared for the future of work that involves understanding and using emerging technology.